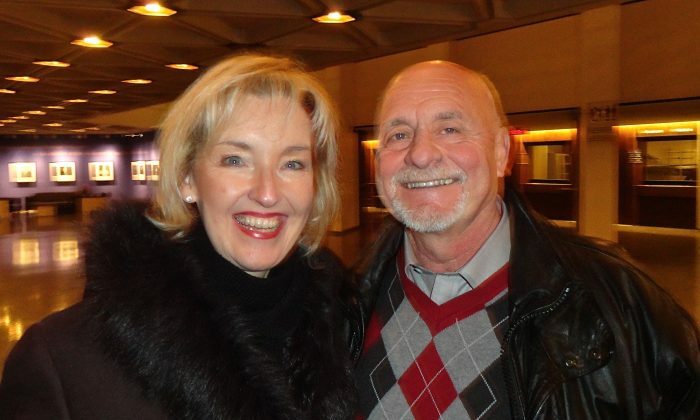 OTTAWA, Canada—Dario Pagliarello and his wife Claire received a first class introduction to Chinese culture after attending Shen Yun’s Saturday matinee performance on Jan. 3 at the National Arts Centre. Mr. Pagliarello is Operations Manager at Hovey Industries Inc., a local manufacturing company. The company is involved in steel manufacturing and one product they make is heaters to clear switches for railroads. Mrs. Pagliarello is a consultant at Westboro Flooring. “It was wonderful. I really enjoyed it,” said Mrs. Pagliarello about the show. “I didn’t know all that much about the Chinese culture and this was a really good first impression of everything. The couple also greatly appreciated the two emcees who guided the audience through the performance and provided explanations for classical Chinese dance, the foundation of Shen Yun’s dance, as well as the unique orchestra that combines traditional Chinese instruments with a Western orchestra. “That really helped by explaining the dance before. That kind of set the tone,” said Mr. Pagliarello. “It was well explained in between every dance, with an explanation of what they were doing or what it meant to them,” said Mrs. Pagliarello. “It was very, very entertaining, very well done,” Mr. Pagliarello said about the music. He also singled out the two solo singers, a soprano and a tenor. He liked how the lyrics to the operatic songs were displayed on the screen. “It was really enjoyable to listen to and explain exactly what it was all about,” said Mr. Pagliarello. His wife also noted the passion of the singers. In addition to dance and music, a digitally animated backdrop complements the program adding depth to the presentation and illustrating the wide-ranging scenery across the Chinese beaches, Himalayan mountaintops, and Mongolian grasslands. “I loved some of the scenery that they showed,” said Mr. Pagliarello. The Epoch Times considers Shen Yun Performing Arts the significant cultural event of our time. We have proudly covered audience reaction since Shen Yun’s inception in 2006.